Looking for fun non-alcohol drinks to serve at your next party? We searched high and low to find fun party drink ideas – without alcohol – that would get you inspired for your next celebration. 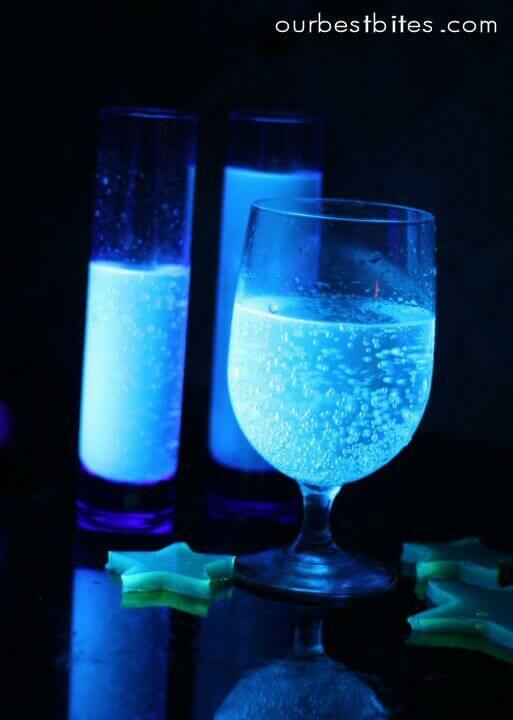 From glow in the dark drinks (yes, I said glow in the dark!) to magical color changing drinks, all the way down to frozen hot chocolate – they’re all crowd pleasers. We even found some fun lemonades, punches, and creature themed drinks to add in the mix as well. As someone who doesn’t drink, I narrowed things down to beverages that would appeal to me or my boy. Cool off with this refreshing Popsicle Mocktail. Special details are part of what make a birthday party unique. Last year, I served water to the kids at Sam’s fireman party in fire hydrant cups. The parents were just as tickled as the kids to see them. So, I have seen firsthand the power of fun beverage presentation! This list of 10 great drinks is perfect to serve to kids and adults. Drink in the inspiration…enjoy! 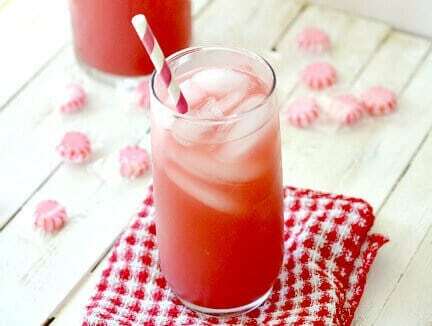 A go-to recipe that will be loved year, after year, make up a batch of this watermelon lemonade for your next children’s party. It’s especially refreshing on a warm day and can easily be adapted by adding other fruits. Add in a little more ice for a slushy effect. 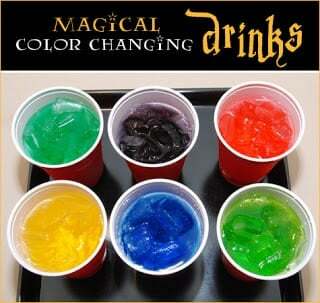 Party guests will be amazed by the seemingly magical color changing properties of this non-alcoholic children’s party drink. Dried food coloring on the bottom of drinking cups, hidden by ice, is the magic ingredient. Watch guests’ eyes grow big with amazement as you pour your favorite clear beverage (Sprite, water, Fresca, Ginger Ale) into their cup and it does a color change before their eyes! A healthier drink option for a child’s party, this banana-berry smoothie with meringue eyes (for Halloween) makes a refreshing choice. You’ll love all of the fresh fruit ingredients that are paired with non-fat yogurt and an optional hint of honey for sweetness. 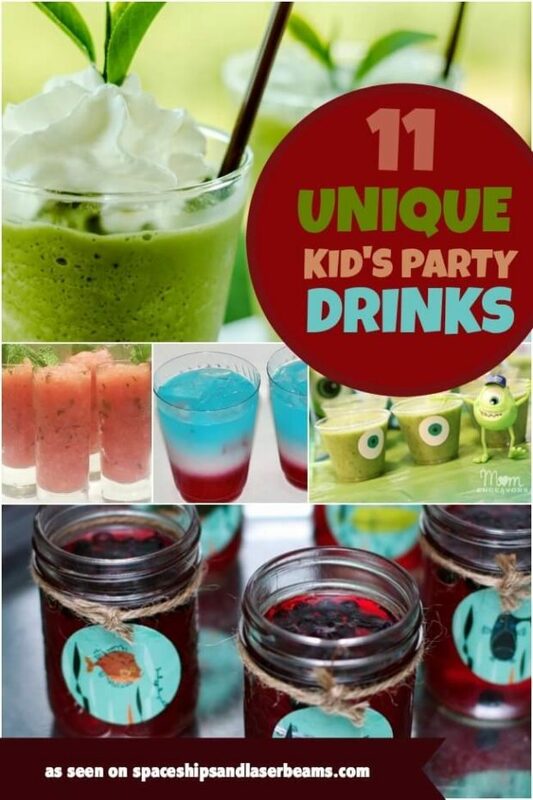 Looking for a fun, affordable non-alcoholic drink to serve at your next children’s party? This is it! Only 3 ingredients are needed to make this refreshing lime flavored swamp juice the hit of the beverage station! 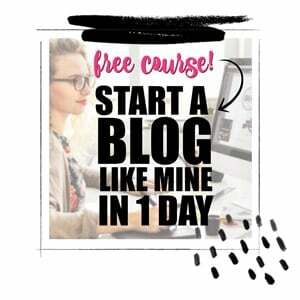 Want in on the top secret ingredient for creating glow in the dark drinks? Tonic water! It has quinine, which when exposed to black light magically glows! 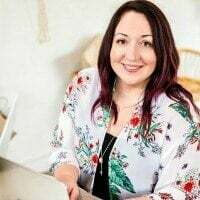 So add a little Crystal Light drink mix with your tonic water, turn the lights off and the black light on for a super fun non-alcoholic children’s party drink! Up the fun factor at your next children’s party by serving arctic shark glacier punch! Make or buy your favorite blue drink of choice and drop some gummy sharks in prior to freezing in individual plastic cups or bigger bowls. 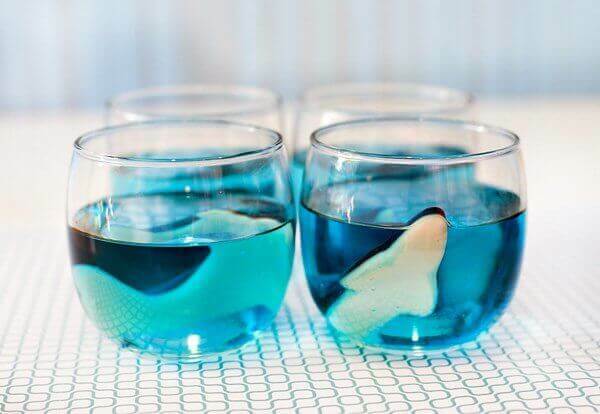 The end results are shark infested glaciers that can be added to punch bowls or kept in individual glasses. Friends don’t let friends drink boring mocktails. This candy apple punch is made from all natural fruit juices and cinnamon candies. It’s the perfect children’s party drink! Say good-bye to boring beverages! 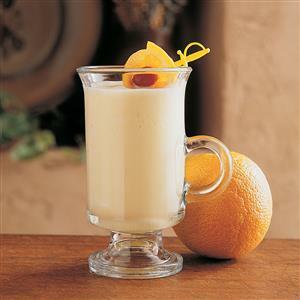 Whip up this recipe for frosty orange smoothies year round as a festive beverage option and alternative to sugary soft drinks. 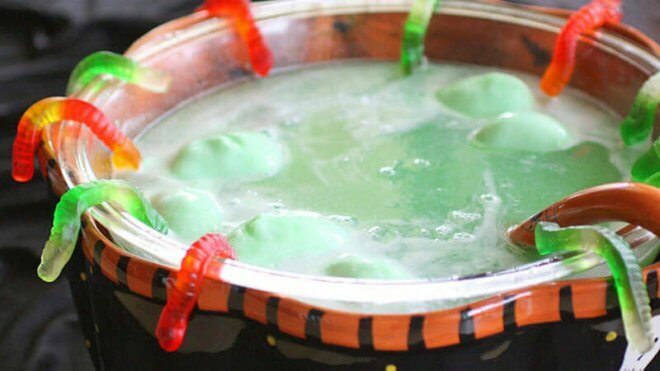 It makes a fun non-alcoholic, kid-friendly drink for holiday parties! 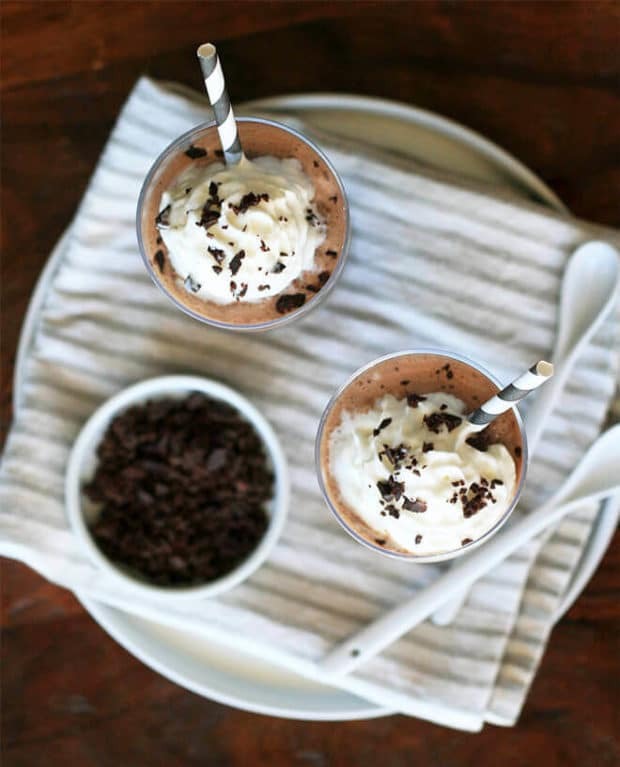 Staying cool when the heat hits is made easy with this delicious looking recipe for frozen hot chocolate. Wouldn’t this be a fun drink for all of your children’s summer parties? When a drink recipe calls for sorbet, you know it’s a sure fire hit. 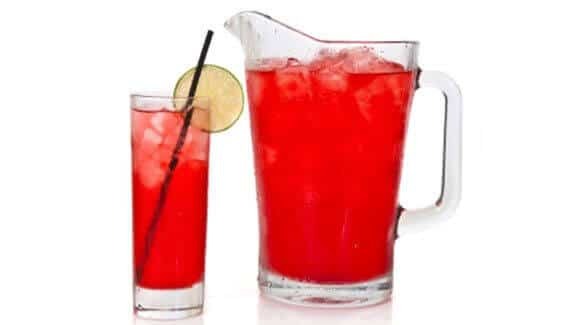 Make up this Hawaiian Punch summer drink and thrill all the children at your summer celebrations! Plus, check out more drinks perfect for your next party.